Tracea Rice (JD ’19) has been selected as a 1L Diversity Fellow for Fish & Richardson in the firm’s Washington, D.C., office. Rice is one of six fellows selected from a pool of more than 400 applicants. Fish’s 1L Diversity Fellowship Program awards fellowships to diverse first-year law students across the U.S. as part of its Diversity Initiative. According to Fish’s website, the initiative links the fellowship program with a variety of other programs and offerings related to recruitment, professional development, retention and outreach in the legal and business communities. Each Fish Diversity Fellow receives mentoring throughout their law school education, a paid 2017 summer associate position in one of Fish’s U.S. offices, and a $5,000 academic scholarship. The 1L Diversity Fellows also receive an additional $5,000 scholarship if they receive and accept an associate offer with the firm after the completion of a 2L summer clerkship at Fish. All of Fish’s 2017 Diversity Fellows are given the opportunity to participate in the 1L Scholars Program of the Leadership Council on Legal Diversity (LCLD), which was created to strengthen the legal pipeline by expanding the number of opportunities for diverse first-year law students. LCLD is a national organization made up of more than 265 general counsel and managing partners of the leading corporations and law firms in the country who have dedicated themselves to creating a truly diverse U.S. legal profession. Adam Pan, a student at Yale Law School (2019), will work in Fish’s Boston office. Tracea Rice, a student at Wake Forest University School of Law (2019), and James Riddle, a student at Yale Law School (2019), will work in the firm’s Washington, D.C. office. Ismael Sarmiento, a student at the University of Texas Law School (2019), will join Fish’s Houston office. Veena Tripathi, a student at the University of Minnesota Law School (2019), will work in the firm’s Twin Cities office. Ka-Lo Yeh, a student at Harvard Law School (2019) and currently a law clerk in the Boston office, will join the firm’s Silicon Valley office, where she previously worked as a technology specialist prior to law school. Three Diversity Fellows from Fish’s 2016 program also will return to the firm for a second summer. Adam Aquino, a student at the University of Chicago Law School (2018), will rejoin the Washington, D.C. office. Sarah Jack, a student at the University of Iowa College of Law (2018), will rejoin the Twin Cities office. James Yang, a student at Harvard Law School (2018), will divide his summer between Fish’s New York and San Diego offices. 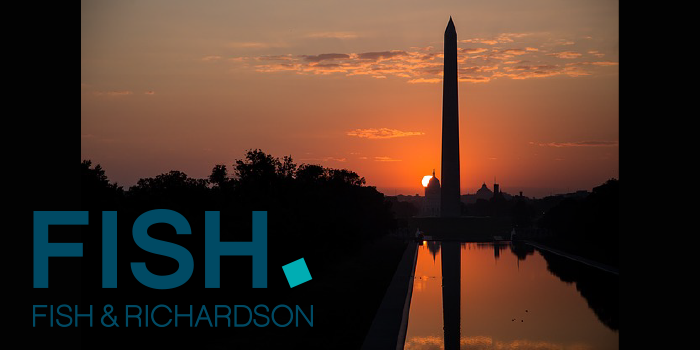 Fish & Richardson is a global patent prosecution, intellectual property litigation, and commercial litigation law firm with more than 400 attorneys and technology specialists in the U.S. and Europe. Fish is the #1 U.S. patent litigation firm, handling nearly three times more cases than its nearest competitor; a powerhouse patent prosecution firm; a top-tier trademark and copyright firm; and the #1 firm at the Patent Trial and Appeal Board, with more cases than any other firm. Since 1878, Fish attorneys have been winning cases worth billions in controversy – often by making new law – for the world’s most innovative and influential technology leaders.